Ethiopian People Patriotic Front Guard ዓላማችን ራዕያችንን እውን ማድረግ ነው!! 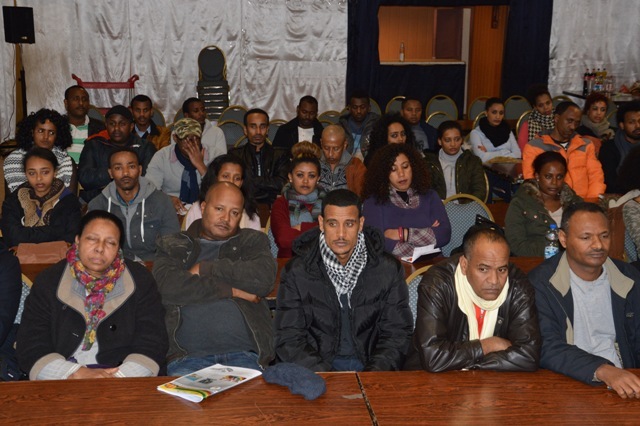 The Ethiopian Peoples Patriotic Front Guard (EPPFG) regular meeting held on Saturday May 5,2018 in Nürnberg city . The members meeting held starting from 2 pm local time . The participants had extensively discussed about the current situation of the country. The Ethiopians who lives in different part of the world ,out of their country , are working hard for the current release of small number of political prisoners. Though large numbers of political prisoners are still on suffering in different part prisons in Ethiopia, it is a good beginning. The EPPFG members believe that all political prisoners which are still remaining in prison should free without any requisites. We should be continuing our struggle for their freedom and we have to be a voice for them. Even if the new prime minster Dr . Abey Ahmed is saying good words about being an Ethiopian , we should not forget that he is also from EPDRF and there is not structural change which he brings to the citizens . Still Ethiopia is in prison of Wayne; there is no freedom of speech and roots of Democracy. EPPFG believe that Ethiopia and its nations are in multiple problems. It is not that easy to bring solution by bringing one new prime minister to power. The suffering of people is continuing by changing its style ; so we have to keep our struggle until the end of Ethnics politics and one group dominance from our beloved country. Still peoples are displeased by deliberate action of Wayne. report of the organization to the participants . One of the sessions of the meeting was current affairs; on this session there was live discussion between participants based on the article from Graham Pebbles, how current ethnic conflicts are deliberate government design. The master mind of the current Ethnic conflict, in different part of the country, is the Ethiopian government (Weyane) .The government use this tool to divert attention of Ethiopians from their grievance. It is clearly known that in different part of the country there is uprising of citizens in different forms. From stage the discussion chaired by Bikesegn Haileleul (chairman man of EPPFG in Bayern region) accompanied by Mr. Alemayehu Kidanewold (Chairman of EPPFG in Würzburg area) and Mr. Yohans Tkaere Getnet ( vice chairman of EPPFG in Bayern region ). Participants were actively participated on the discussion. And finally the meeting has been concluded by replaying possible answers from the stage which have been asked by participants. The committee of the Ethiopian people patriotic front guard ( EPPFG) will be holding its regular meeting on today On 19 October 2017, accomplished a very successful meeting in Schweinfurt. The meeting was started around 2:00pm by Mr. Alemayehu Kidanewold who is the Chairman of the EPPFG in Around Würzburg speech about Committee’s major activities in the past, including regular report and detail explanation about the current political situation in Ethiopia. After reports were heard from representatives of Committee’s, They discussed properly on issues about how we could be strong in our movement for liberation of Ethiopia. Participants were aware of the current problems and situation of Ethiopia due to lack of justice, freedom and democracy in Ethiopia. Ethiopians highly controversial anti terrorism law ,proclamation Human rights organizations, Journalist and others expressed grave Concerns that the law contained an overly broad and vague definition of terrorism, gave the police and security service new powers ,usurped citizens ,constitutional rights and shifted the burden to proof he accused . The Ethiopian government is using laws and judical processes that fail to meet international human rights standards to barass and stifle dissent,targeting activists, human rights defenders opposition party leaders, memmbers and Journalist . UNHCR,Amnesty international , UN special reporters HUMAN RIGHTS WATCH They criticise and oppose The Ethiopian Anti terrorism law and you can see Human rights organization reports . We are oppose these cruel and dictator government to save Ethiopian people. 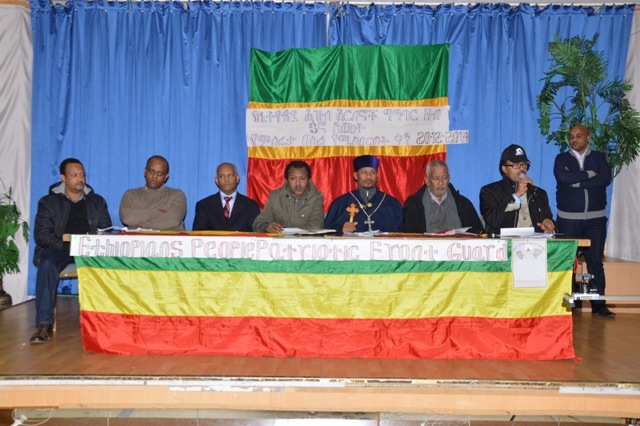 March 4, 2017 - the Ethiopian People Patriotic front Guard (EPPFG) had honored the 121st Adwa victory day and conducted its regular meeting in Nürnberg. The meeting was conducted from 14:00 to 17:00 local time. 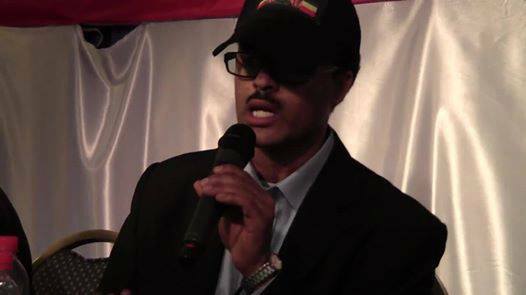 Mr. Luel Keskis chairman of the Ethiopian People Patriotic front guard Germany opened the meeting by his welcome speech. On his speech he honored Patriots during Adwa Victory and Emperor Millink II . He said it is 121 years since Ethiopian army which leads by Emperor Millink II defeated Italians at the battle of Adwa. The Ethiopian victory in 1896 was the battle that ended Italian Colonial ambitions in Ethiopia. Though In this period of time there remarkable victory proud us (the Ethiopia Nations), the so called Wayne (one ethnic) government colonize Ethiopia since 25 years. Weyane would erase this victory by running one ethnic policy by dominating and killing others - therefore we should stand and struggle like our fathers. On his similar speech we should be careful and selective on using social Medias. We should not take part in sharing useful information and photos that help Weyane . Because after the people , who is in current struggle , photos or interviews exposed on media they have been killed by Weyane killers . We who lives abroad are became the source of information and working against the current struggle. Followed Mr. Luel speech there was a short movie from internet about ADWA victory. 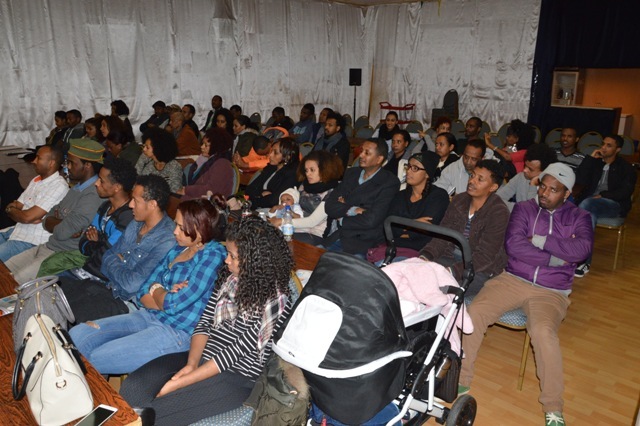 From stage the meeting was conducted by Mr. Tilahun Gudeta (EPPFG –Gemeny Secreatry general ),Mr. Bikesegn Haileleul (EPPFG Bayern vice president ), Mr. Alemayehu Kidanewold (EPPFG Würzburg area president ) , Mr. Rodas Tesfaye (EPPFG Hessen area propaganda and advocacy head) . The current Ethiopian political situations and state of Emergency was the main topics and took great discussion among the participants. On the second half of the meeting there was question and answer from participants . የህዝብን የመብት ጥያቄ በኃይል ለመገደብ መሞከር የከፋ ዋጋ ያስከፍላል! ሁሉም ለናት አገሩ ዘብ ይቁም! Wonderful! Good interview! I am proud of you! This afternoon, I listened to the panel discussion on your esteemed Radio Program, Addis Dimts, with the three guests, (journalists Senay Gebremedhin, Knife Assefa and Ato Leul Keskis) about the Issayas Afewerki’s recent interview on ESAT. I found it to be a truly remarkable and historical discussion. This discussion has demonstrated the true character of an independent media by providing opportunity to air diverse opinions on such an important issue. I believe that today’s discussion will be recorded as an important interview in the history of the Ethiopian Diaspora media. I have no doubt that it will also generate immense conversation among Ethiopians. ኢትዮጵያን ለማዳን ወቅቱ አሁን ነው!!! School 2nd Alvarez also Fasilides school junior high school 2 Total completed. Then the former Ethiopian army officers joining hurišo training by signing a three year school graduates Military Academy and graduated with the rank of principalities percent. Next, as the 2nd Revolutionary Army commander and assigned beshelek’e bezeriyedireši 27 th Brigade mekeneyizidi leadership in Eritrea have dozens daunting. Mešiwe’ātineti have made their country great. In addition, the School of Law and graduated in central statistics office employees worked for 11 years. Ethiopia then became one of the facets of the country's precious sons lead the response and coordination in the setting of peace and democracy activist organizations established to bring peace in the country. Bebuzuwochi was given great hope to the people of our country, but the TPLF group betech’enegefewi ā.miretu the 1997 election, voting on behalf of the city of Gondar, Ethiopia tewededirewine broad public support, gained as a member of parliament for a limited time option for some time been signed off by Parliament, but Parliament TPLF Ethiopian people inidemeyiwekili understand the problem and yetegenezebutinimi Reporter went to press statement they leave the desert. Ānibegenenochini armed conflict, unless the democratic choice of the people acknowledge their authority inidemeyeširekibu confirmed Mr. Patriotic Front Catch joined the people of Ethiopia and Eritrea, which might in time. For 10 months have involved armed struggle. People's Patriotic Front Guard (EPPFG) are the chairman. Yenik’et’ek’et’ewini years ago, based on attacking people merging with the National Democratic Praetorian Guard is a filter ongoing struggle of the people of Ethiopia Patriotic Front. This starts from the bush starred What school? Mr. Prince-agency does not have much more than a label. However, the label has been known as the Ethiopian People's Patriotic Front Joint Guard (EPPFG) in order to strengthen political and diplomatic activity and prevent the organization's overall risk of hackers. In general, cabinets and efforts to strengthen the organization's activity in the country, which has been discussing earlier high officials and members of the foreign national. Finally, the last meeting approved the decision tešetobeti which had the support of all members of senior management. Dawn: What is currently the organization's activity? This agency represents the understanding of how important the community's public agenda. A foreign country continues to intensify diplomatic and political work. Foreign Affairs Diaspora lives in share values. Is unhealthy. However, it is important to work together as a stronger organization to carry on the struggle. That's why our organization is fulfilling seeker changes in foreign assistance to the Ethiopian people gathered role in digital. That number is increasing from a display. In general, the organization of the people who benefit are the people Patriotic Front guard at yetegenezebebeti more people living both inside and outside the country. What is your relationship with Dawn-attacking struggle with other political parties? Instead of talking to the TPLF quick work together in order to solve the land question has the option to call forward speed. Protests held a war council in Frankfurt sending its own message of support refers to a good start in the country to collaborate Carrying case. We are working together with Mr. t’i’āhuni at the hands of the organization are. How do you see the dawn-currently the country's current situation? It is shown animosity. Another is a campaign to destroy the National yemiyekehēdewi religion. The Muslim community suffered more injustice might specify that surpasses today. And the activity going on in the Orthodox religion, confirmed the TPLF regimes. Previously aired by appointing its own political system has been bishop of the religious framework detonates linking religion with politics for 22 years. Today, this function is not so. Yemi’imenuni vote to appoint the bishop of abducting a politician. This indicates that the country is negative gang. Mr. Prince-dawn All of this was said. How far ahead and freely travel experience TPLF Combat Team Do? Mr. Prince is a very good question. EPLF, TPLF is basically āmešereretu carry kešehili EPLF is a group of youths entered the desert, brought in Brussels. Telelekinetuni yemeleketewimi recall EPLF EPLF and TPLF Ethiopian control of the country for seven years inidizerifi grant is that the TPLF. For example, the recent history of a single province feet coffee plant coffee compliance extorting T Made in Eritrea that she make foreign exports. Before dawn-coast Ethiopia had three doors. Each of the gates of a Marine currently does not see how this matter your organization? Future country believes that what should be done in a sea? Mr. Prince-now is a good question. It is clear that Ethiopia had three ports. Djibouti, purpose and Massawa three were devotees of the sea. Djibouti is a matter that arose because of their high cube to increase Ethiopia, Emperor Menelik II. Ye’āšebine yemits’iwe, however, is different. Our border is k’eyibehiri. Eritrean Constitution had put in a corner Sha'bia people of Ethiopia and Eritrea will only illegal, it is illegal to work. Still, the country is part of the mind in northern Ethiopia miširik’i. Not the Eritrean regime. We knew the people. The port is a matter of time caring. It is not a matter of misunderstanding. Ethiopia Ethiopia future constitutional system established to devise a legal filing her legal rights. No matter what are the people of the two countries and the two brothers who hate gangs. Finally, if you have a morning-message? Thank you for the duration of our early-morning. All of those members of the party had been granted refugee states and/or accepetance by the German governement.